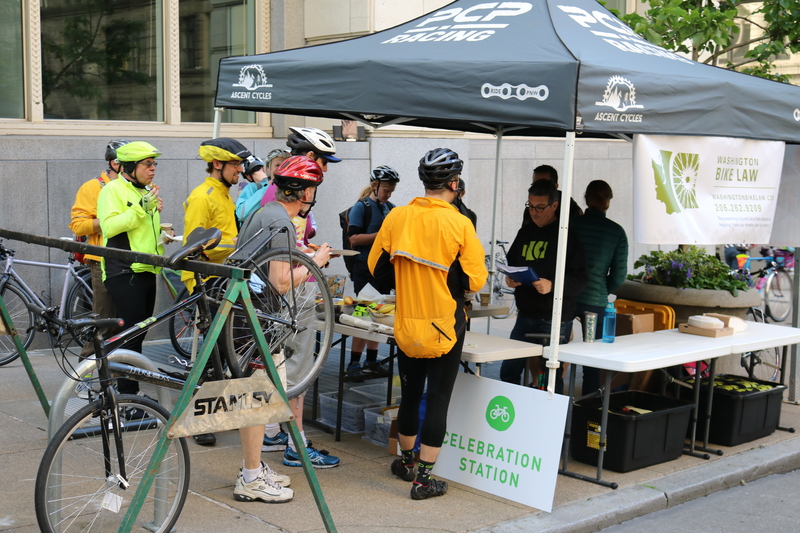 Don’t pass us by without stopping… our Celebration Station will be open 7 am to 9 am May 18, 2018. 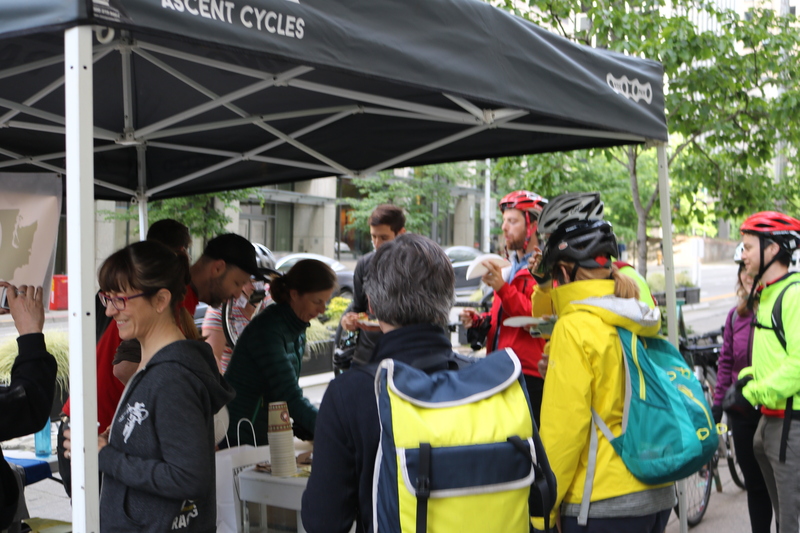 We’ll be across the street from our office at Second and Cherry on the Second Avenue Bike Lane. 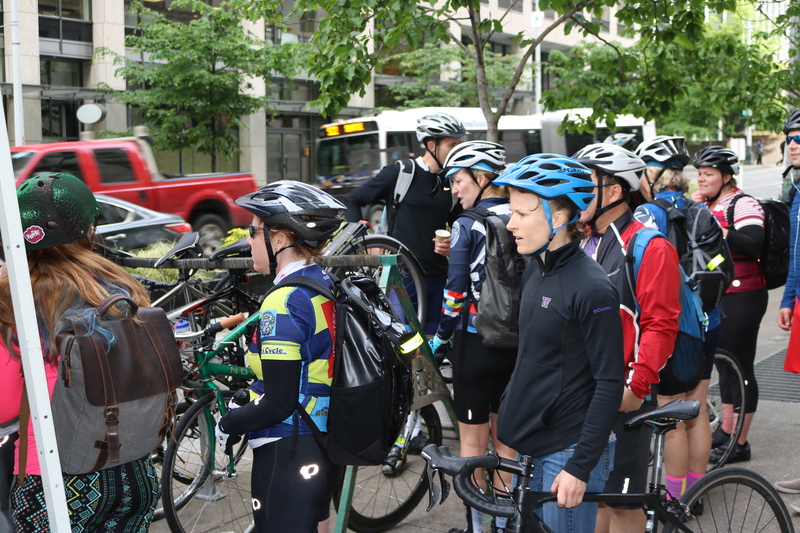 Seattle Neighborhood Greenways (SNG) will be joining us on May 18. 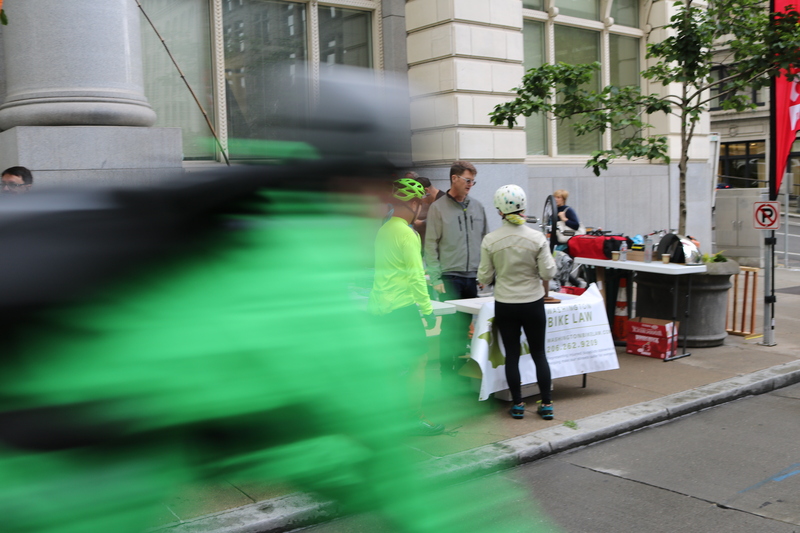 SNG is the grass-roots based Safe Streets Advocacy organization that is probably in your neighborhood. Get involved with SNG! 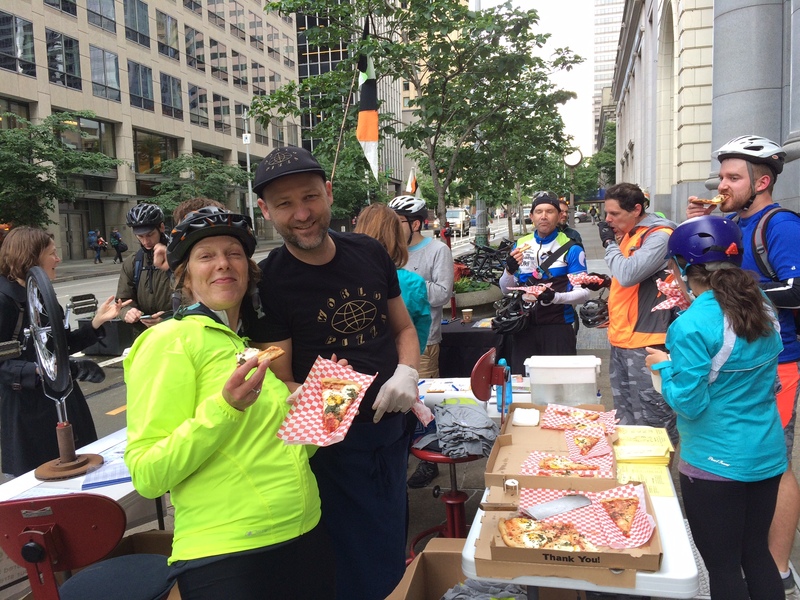 Also joining us for the third year will be World Pizza… who can resist fabulous free breakfast pizza?! We’ll also have world-famous Cherry Street coffee. Fuel up. We’ll even have water. 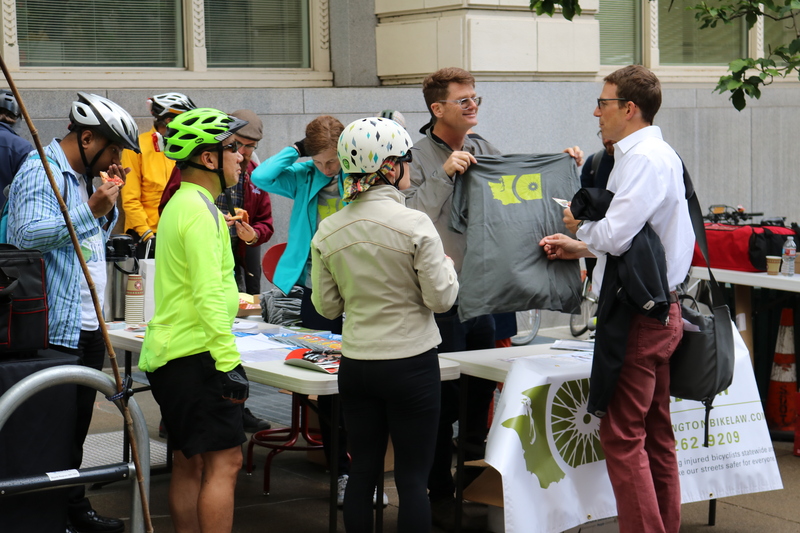 But wait, there’s more… you can win fabulous prizes… like T-shirts, flat repair kits, our famous waterproof Bike Law spoke cards, stickers, and more! Come on down… or up. Come by and say hi! 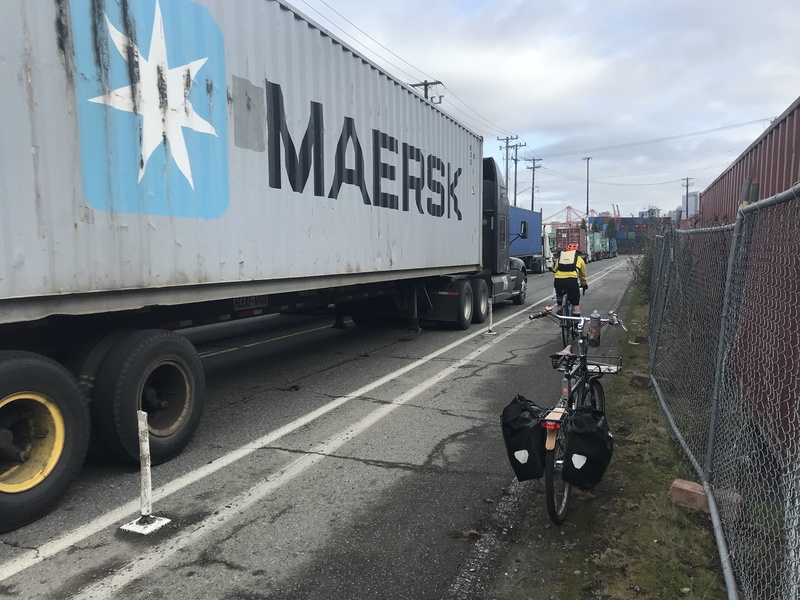 Lots of other people noticed the small section of truly physically protected bike lane south of downtown I recently pointed out on my Twitter. Even my little Twitter account got 65 ♥! But what he linked to hasn’t been updated since November of 2017. This is not acceptable. 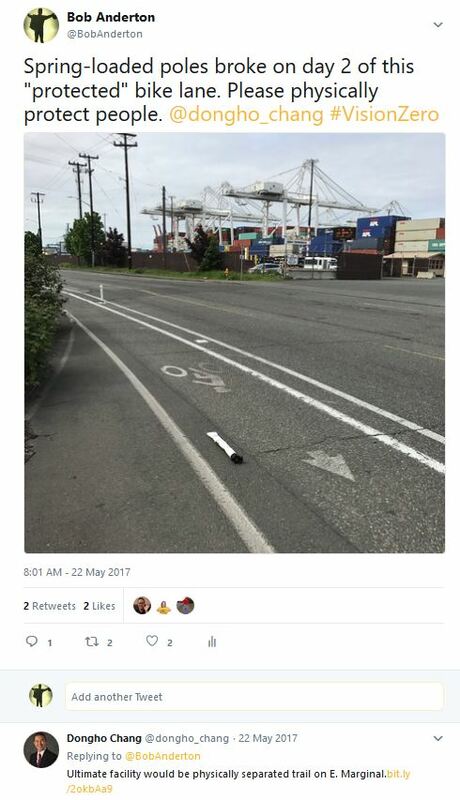 We already had one person killed on this key piece of bicycling infrastructure. 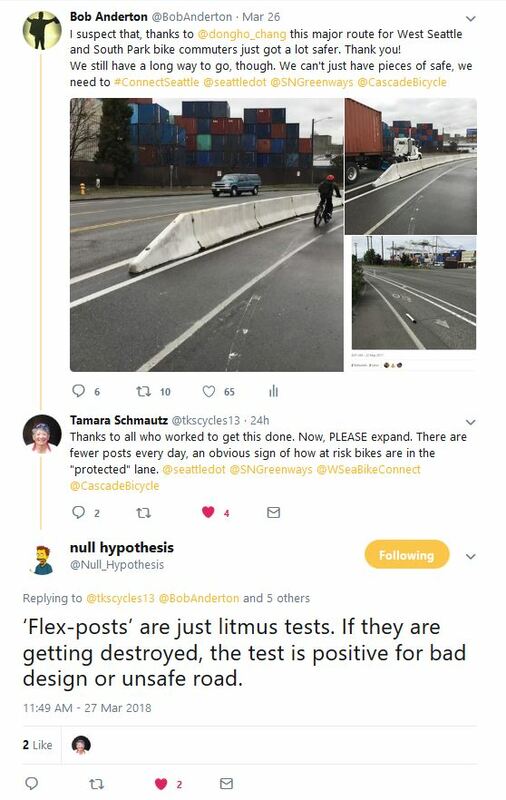 Let’s #ConnectSeattle and let’s do it BEFORE another person dies to motivate actual action. 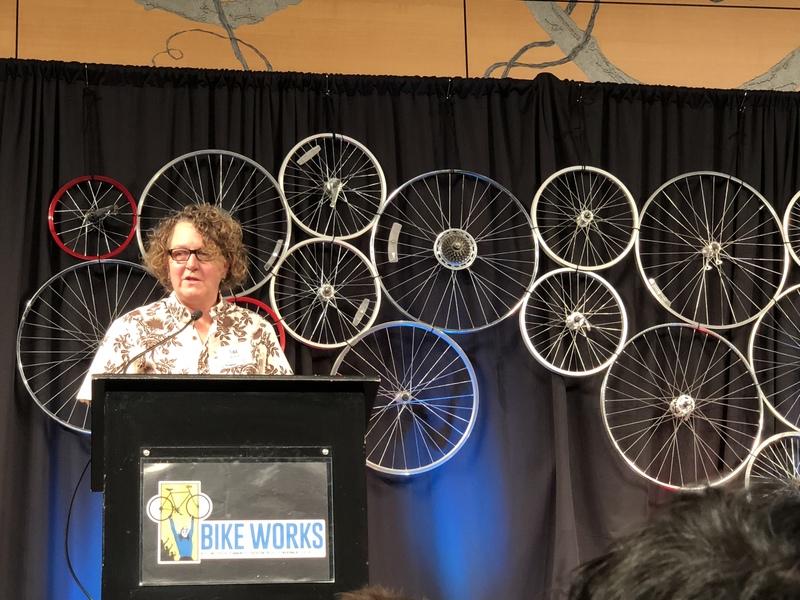 Washington Bike Law was the Title Sponsor of Bike Works‘ Annual Fundraising Dinner on Sunday. I’m pretty sure that we weren’t the only ones who had a good time, but we did have a good time… and for a great cause. If you don’t know about Bike Works, check it out! And even if you do, check it out, it’s probably even more awesome than you thought. If you have a couple minutes, you should watch this video about Bike Works. It’s hard to convey how amazing this organization is, but this video shows it pretty well. 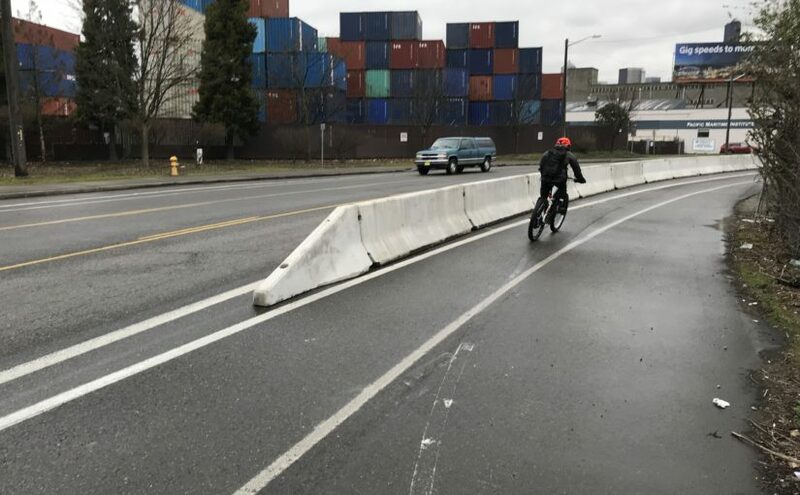 To top off this off, on my ride into work this morning, I found the the non-protective spring-loaded plastic cones on a fairly scary bike lane on East Marginal Way had been replaced by big cement barriers… Nice! This is particularly pleasing because I had no faith in those cones as I watched them regularly get mowed down. Thanks Dongho! 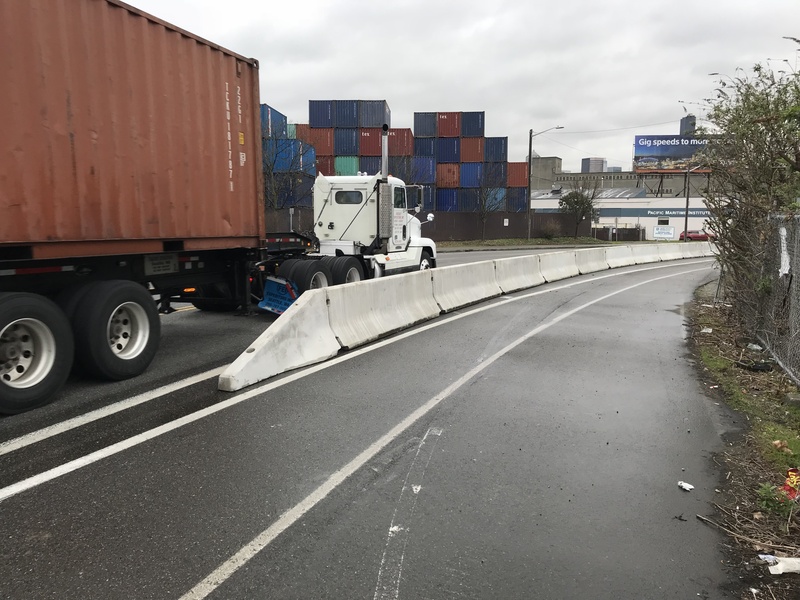 Now let’s protect the rest of this route… and other routes so that everyone can feel safe riding in Seattle. 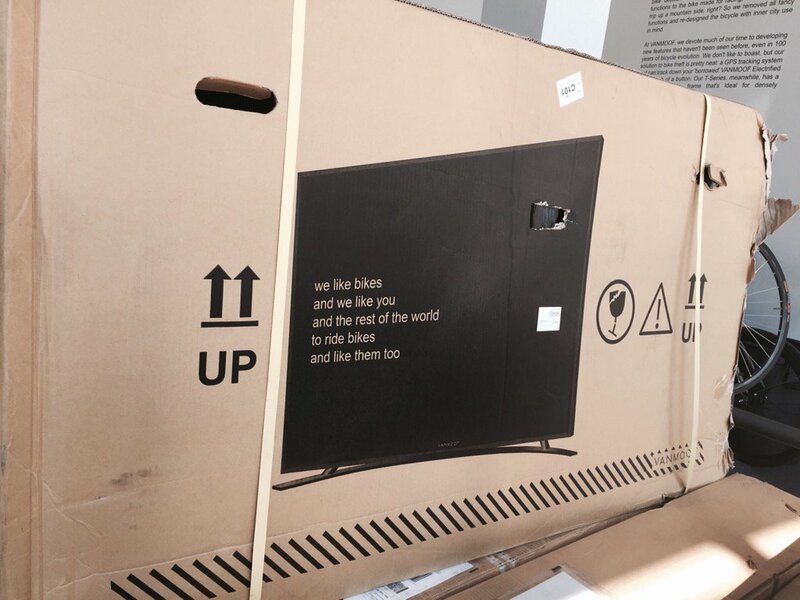 So, what does this song have to do with bikes? Apparently Tee Vee is STILL the thing here in the USA. 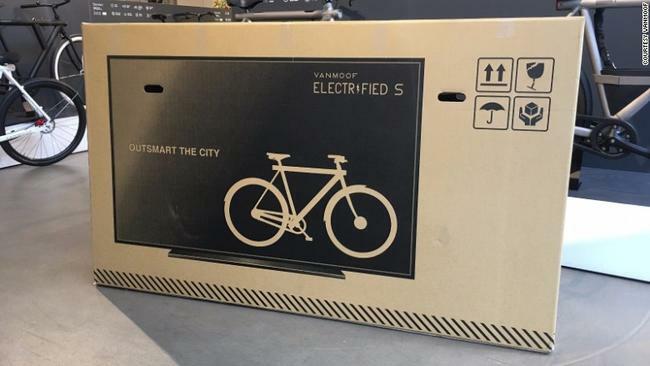 I learned from Bicycling Magazine (which basically lifted a CNN report) that Dutch bicycle manufacturer Vanmoof figured out how to solve a problem with damages in shipping. 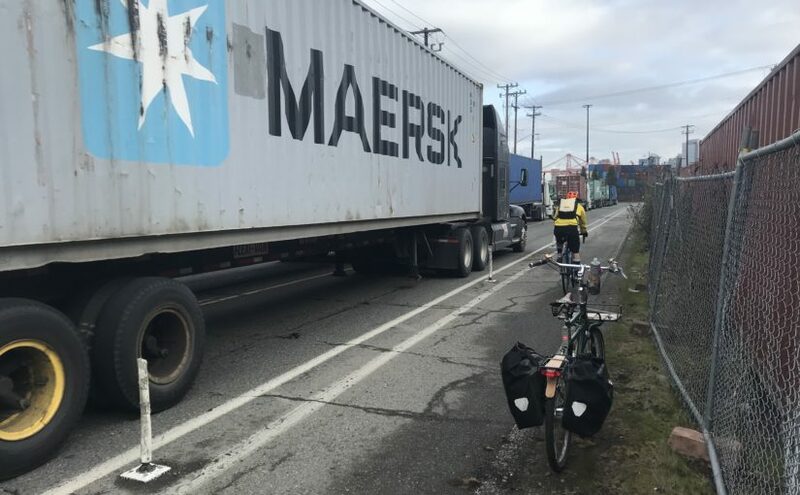 More than 25 percent of its bikes were damaged in delivery. The problem was especially bad when shipping to the U.S. The solution? Reconsider the packaging. “We asked ourselves, what do Americans really love? 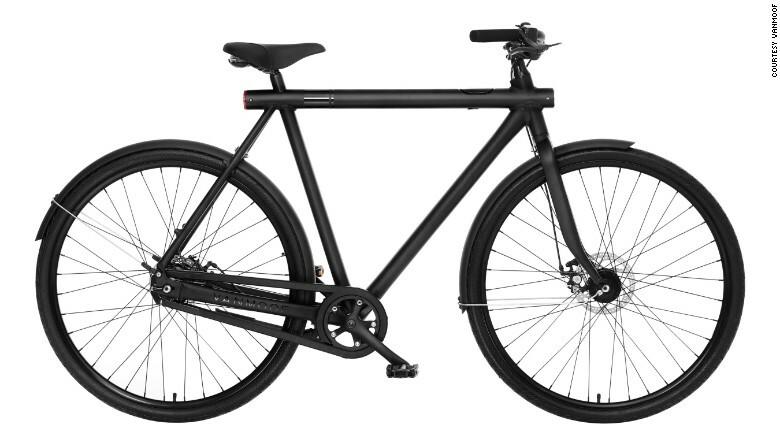 What would prompt couriers to be delicate with a parcel?” VanMoof co-founder Taco Carlier told CNN. Damages dropped by 80 percent since then, according to the company.